Sometimes looking at a map can tell you a lot. Take a look at this map, for example. It shows that Russia is a largely landlocked country. Unless you count its far northern shores deep inside the Arctic Circle. Vladimir Putin aspires to revive Russia as a world power, according to news accounts. That may be a pipe dream. As we found out once the Cold War ended, the Soviet Union’s power was actually kind of a Potemkin village all along—an especially apt metaphor since we’re talking about Crimea 🙂 —in the way that its breathtakingly aggressive display of military strength concealed a dilapidated economy on the verge of collapse. Conventional wisdom holds that no nation can become or remain a world power without a strong navy to support its global interests. Few lessons from history have remained as incontestable as the importance of sea power to a nation’s political and economic standing. Sea power has been the ultimate measure of global reach and influence since the Greeks stemmed Persia’s land conquests with a naval victory at Salamis Bay in 480 B.C. Despite having the largest and best-trained army in Europe in the mid-1700s, France lost its overseas empire, including Canada, to Great Britain because France could not support its colonies via the seas. Great Britain held onto a worldwide empire where the “sun never set” throughout the nineteenth century only because of the superiority of the Royal Navy. Now let’s take a look at another map. This comes from Wikipedia’s entry on the Black Sea. See Ukraine at the top center? That’s the Crimean peninsula hanging off of it. You may remember Yalta as the site of a famous meeting between Franklin D. Roosevelt, Winston Churchill, and Joseph Stalin toward the end of World War II. (See the Yalta Conference photograph of the three men on Wikipedia here.) The city you need to pay attention to with respect to the current crisis in Ukraine is Sevastopol, just around the lower tip of Crimea to the west of Yalta. Sevastopol is home to Russia’s Black Sea Fleet. So in addition to the complex history shared by Russia and Ukraine, you have a naval base of extreme strategic importance to Russia (as it is Russia’s only warm water base). And feelings in Ukraine toward Russia’s continued presence in Sevastopol have been conflicted to say the least. In 2010 Russia’s lease on the Sevastopol installation was extended until 2042. Take a look at this Reuters news clip of what happened in Ukraine’s parliament when the ratification vote was counted. Russia will not allow its control of Sevastopol to be weakened, which goes a long way toward explaining the presence of its troops in the Crimean peninsula. If Ukraine were to join the European Union, would membership in NATO then follow? And if it did, wouldn’t it be exceedingly strange to see a Russian military base hosted by a NATO member! Russia blocked a UN Security Council resolution in early January that would have expressed outrage and condemnation regarding the Syrian government’s daily air strikes in Aleppo. Russia also opposed a statement in December that would have condemned attacks by Syrian government troops upon civilians, and Russia (with China) blocked three earlier attempts by the Security Council to condemn and possibly impose sanctions against President Bashar Assad’s government. It’s not that Russia loves Assad so much as Russia needs a stable relationship with Syria. Which brings us to Turkey. Things have been relatively quiet in Turkey lately, but here and there citizens rise up in protest, mostly against the policies (and alleged corruption) of Prime Minister Recep Tayyim Erdoğan. Wikipedia has a really nice timeline of events in 2013-2014. Last June I reblogged a Freshly Pressed post by Insanlik Hali, “What is Happenning in Istanbul,” about the spontaneous demonstrations mounted by thousands of citizens in Turkey’s largest city, initially against Erdoğan’s plans to demolish a popular park in order to build a shopping center but quickly becoming more about unhappiness in general with life under the Erdoğan government. Demonstration outbreaks have continued to erupt in several cities, most notably Istanbul, this past December, January, and February. 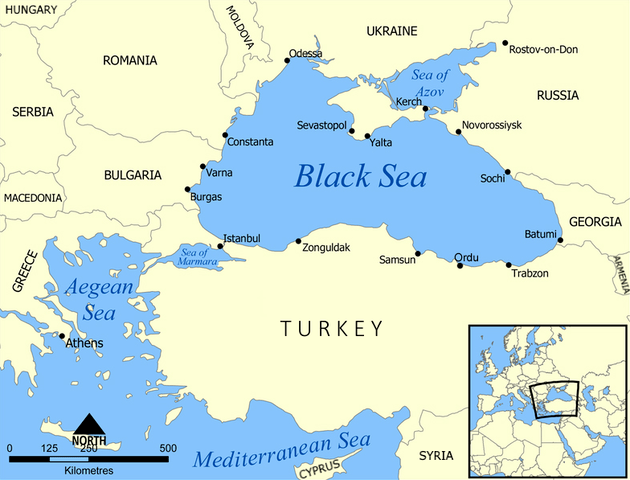 Take another look at that map of the Black Sea. There’s just one way to get from Sevastopol to the Mediterranean and, thus, out to the Atlantic and rest of the world. The map below (once again from Wikipedia 🙂 ) shows a close-up view. Bosphorus Strait, via Wikipedia (CC BY-SA 2.5); en:User:Interiot – en:File:Turkish Strait disambig.svg modified from Image:Vertrag sevres otoman.svg, created by Thomas Steiner. Turkey controls this passage, and Russia needs a stable Turkey, especially a stable Istanbul. Yet Turkey and Russia have a somewhat adversarial history, particularly with regard to Crimea. The Crimean War of “Charge of the Light Brigade” fame (“Theirs not to reason why, / Theirs but to do and die”) was a struggle between Russia and the Ottoman Empire (in alliance with Britain and France). Toward the end of World War II, Joseph Stalin deported a couple hundred thousand Crimean Tatars (Turks) from Crimea, allegedly because they were collaborating with the Nazis. Over a hundred thousand of those deported died of starvation and other causes. And now Russian troops are apparently taking over Crimea. What is Turkey to do? Engage in the very delicate balancing act of honoring ties to the Tatars, its ethnic and religious (Muslim) bretheren, and forging diplomatic bonds with the new Ukrainian government in Kiev—while at the same time not arousing the ire of Russia, from which it gets at least half of its natural gas supplies and against which it has historically lost many wars. Just this past week, about 250 protesters, mostly Turkish Crimean Tatars, gathered outside the Russian consulate in Istanbul. They want Turkey to use its influence to prevent Crimea from being annexed by Russia away from Ukraine. This entry was posted in History, Life, News, WPLongform (posts of 1000 words or longer) and tagged Black Sea Fleet, Crimea, Crimean peninsula, Crimean Tatars, Istanbul, Russia, Russian, Sevastopol, Syria, Taksim Square, Turkey, Ukraine, UN Security Council. Bookmark the permalink.